Northerners have developed a now-familiar migratory pattern of leaving their empty nests in the North to head South during their retirement years -- or seasonally (December through the March) -- if they can't afford relocation. In the past, they used to be easily identifiable by their white hair color (or sometimes light blue or orange from a dye job gone bad) and were often witnessed driving gas-guzzling Cadillacs or Lincolns down Highway 1. Even though tourist traps love taking the money these seniors typically spend, most native residents see them as interlopers or carpetbaggers and the resulting refrain: "Yanks, go home," has became a common one. 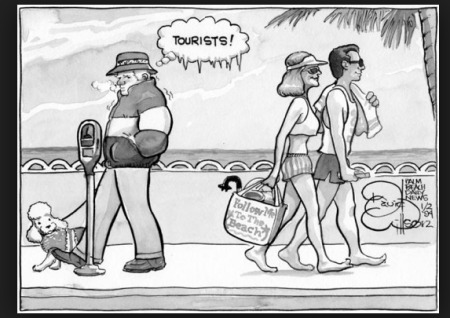 In addition to the congestion they cause on the thoroughfares, Snow Birds are known to regularly infest restaurants, post offices, retail shops, hospitals and doctors' offices in droves. It is this 1950s zeitgeist I didn't initially realize I was stepping into, when I took to heading south the other day from my home in the New York Metro area. From Jersey City to Galloway township on the Garden State Parkway, it's only a two-hour trek - but it is due south. Packed with binoculars, an iPhone camera and some bottled water, I was on a mission to see a rare sighting - a visit from the illusive "White Snowy Owl." 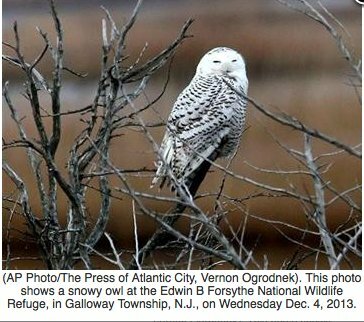 Word had traveled fast via TV broadcasts, tweets and status updates that three white snowy owls had been spotted in the Edwin B. Forsythe National Wildlife Refuge just north of Atlantic City. While not a birder but more of an avian fan, I understood this to be a once-in-lifetime occurrence. So, I similar to so many other Northerners seemed to be forming our own migratory formation in assuming the modern-day version of the stereotypical role of Snow Birds -- as I started my very first Big Year -- by setting my compass south to climes unfamiliar. Upon arrival, and after visiting the Information reception area at the Refuge, I secured a pass to drive into the marsh area, flooded by last year's Hurricane Sandy. It was there I sighted the Harry Potter-like Snowy Owl for the first time sittling on a rock, near the water's edge, not more than ten yards away. And, it was there that I began to feel more and more like a Snow Bird from the past invading a sanctuary visited by winged creatures and protected by local park rangers. 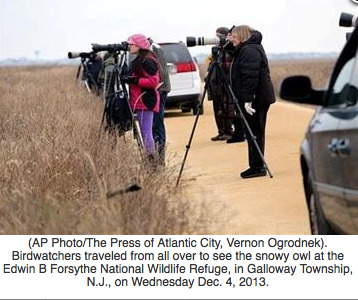 I was the "outsider," not the white snowy owl. He was using this wildlife corner of the world for what it was intended - a refuge. I, and dozens others were eavesdropping on their solitude, as if we (a boisterous lot) had barged into a library and took a seat next to a student deep in thought. The traffic jam on the one-lane trek down Wildlife Drive was the first clue that other Snow Birds had touched down - and the number of photographers with high-definition telephoto lens quickly became a photo opp, in and of itself. But the real tip-off that I had become a Snow-Bird-for-the-Day was when a female park ranger started yelling at us vehemently: "Back away from the owl, you are too close - you'll frighten him," that I realized we were the rarest of species - not the white snowy owl - he was entitled to visit - we, on the other hand, might as well been wearing name tags, labeling us: "cluelesstourista-sapiens!" But I guess I don't really care what they call me - because at the end of the day - I got to list my one and only rare bird to my very first Big Year -- and take it from me, fellow Snow Birds -- that was a rare hoot indeed! Aardvarks - The Animal Video of the Day!! !